Strip is a family of wall, ceiling and suspension lamps of very reduced thickness for linear fluorescent tubes, designed according to modularity standards allowing sequences and juxtapositionings according to geometries "in equilibrium". 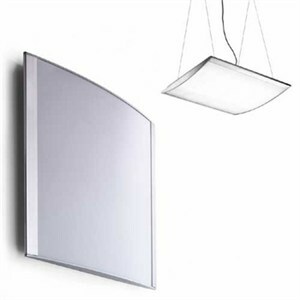 Its very few basic elements such as the diecast aluminium shoulders, the extruded aluminium distancer profiles, the electrical component housings and the opaline polycarbonate diffuser screens, allow modular lighting units of different dimensions and brightness to be created, whose common feature is their flat, low profile very close to the wall. This thickness reduced to the minimum makes Strip particularly suitable for places requiring unobtrusive lighting that adheres as closely as possible to ceilings and walls, for example in corridors and staircases. The wall-ceiling Strip can easily be converted to a suspension fixture with the addition of the suspension kit. Finishes: White or polished aluminum. Dimensions: 29"L X 26"W X 3.3" Extension; suspension kit has maximum overall height of 78" which is field cuttable. Uses 6 X 17W T8 Medium Bi-Pin, linear fluorescent lamps (not included), 120/277V smart ballast.